It’s not easy being a bargain hunter these days! Cut through the clutter and find the right Bangkok Hotel Promotion for your needs. At Novotel Bangkok Platinum Pratunam, get ready for the best room and food & beverage promotions! The search can be daunting when it comes to seeking good deals on hotel rooms in Bangkok. Don’t sacrifice a great location for a deal. You can have both at Novotel Bangkok Platinum Pratunam! Booking directly gives you the best possible rates for all our modern, comfortable room types. 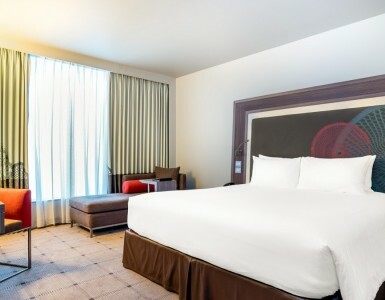 Take your time choosing the perfect fit for you, from our Standard Room to the Executive Suite. With accommodation sorted, you’ll never go hungry at the hotel! Our chefs are happy to prepare you delicious foods from international cuisines to local favorites. Start at our The SQUARE Restaurant on the 6th Floor, home to many fantastic buffet offerings. Enjoy our lunch buffet promotion every Monday to Saturday. Available from 11:30am – 2:30pm, it presents the best Japanese, Chinese, European and more dishes. Seafood lovers and families shouldn’t miss the Seafood Sunday Brunch. Only on Sunday from 11:30am – 2:30pm, savor fresh seafood served on ice, grilled and more! Or try our Completely Crab Dinner Buffet promotion every evening. Taste steamed blue crabs, sea crabs and king crab legs on ice from 6:00 – 10:00 pm. Make sure to bring your credit cards! There is 50% off available for Citibank, Krungsri and Bangkok Bank credit cards and “3 pay 2” for SCB and Kasikorn credit cards. Accor Plus card members enjoy 10% on top of all current promotions. With this kind of coverage and value for money, you are well looked after at Novotel Bangkok Platinum Pratunam. Make your Bangkok Hotel Promotion booking today!